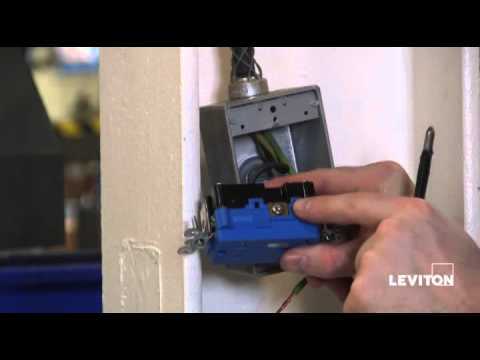 Leviton Decora Plus™ 2-Pole 3-Wire Straight blade receptacle in brown color, has voltage rating of 125-Volts and current rating of 15-Amps. It withstands dielectric voltage rating of 2000-Volts. With back and side wired termination, this receptacle accommodates 14 - 10-AWG conductors. The triple-wipe brass contact ensures optimal conductivity. 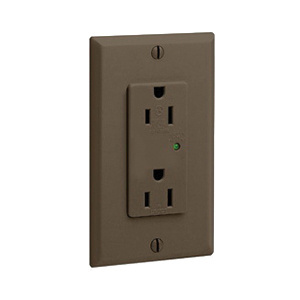 This self-grounding receptacle has brass-hot, green-ground and silver-neutral color-coded terminals for easy user identification. It features thermoplastic nylon face and body. This duplex industrial-grade receptacle comes in NEMA 5-15R configuration. It measures 1.52-Inch x 1.14-Inch x 4.06-Inch. This receptacle features tamper-resistant shutter mechanism that opens easily for the insertion of plugs while preventing entry by other small objects into either outlet slot. Receptacle incorporates indicator light that provides visual indication. This receptacle features steel strap for superior assembly security. The zinc-plated steel clamp nuts keep water and dust from getting into the body of the receptacle. It has brass-plated steel terminal screw that allows for easy external wire management. The brass-plated steel screw and clip ensures better grounding of the receptacle. It withstands temperature range of -40 to 60 deg C. This receptacle has flammability rating of V2 per UL94 to withstand harsh environmental conditions. Receptacle is UL listed, CSA/NOM certified and meets NEMA WD-6, ANSI C-73 standards.